The Slovak Republic has made a fantastic start to the Men's Championship Division at the Liebherr 2017 ITTF-European Championships being hosted in Luxembourg, picking up a stunning 2-3 victory over defending champions Austria in the opening round of Group B matches on Wednesday 13th September. Austria made the slightly brighter start to the match with Daniel Habesohn and Robert Gardos prevailing over Slovak representatives Lubomir Pistej (8-11, 11-6, 3-11, 12-10, 6-11) and Peter Sereda (11-5, 11-9, 9-11, 9-11, 9-11) to give the reigning champions a commanding lead. However, the match was then turned on its head as the Slovak team registered back-to-back victories of its own courtesy of Wang Yang and Peter Sereda, who overcame challenges from Stefan Fegerl (2-11, 11-9, 11-2, 9-11, 11-9) and Daniel Habesohn (11-7, 11-5, 11-5) before Lubomir Pistej completed the win with a stylish performance against Robert Gardos (11-3, 12-10, 11-9). “We are very happy to defeat Austria because we are normally inferior to them in terms of ranking and we had nothing to lose… In general we did not prepare ourselves in any special way for this match except for our usual routine we have for every big tournament. Having played here in the Olympic Qualifying Tournament, we are familiar with the conditions and find them good”, Peter Sereda. Title favourites Germany have got off the mark with a comfortable win as the team of Ruwen Filus, Dimitrij Ovtcharov and Patrick Franziska saw off opponents Spain. Opening the match with a confident display, Ruwen Filus gave the German team the lead with a four games triumph over Álvaro Robles (9-11, 11-8, 11-5, 11-7). Subsequent wins for Dimitrij Ovtcharov and Patrick Franziska against Spain’s Carlos Machado (11-3, 11-3, 11-4) and Jesús Cantero (11-5, 11-9, 11-5) sealed the two points for Germany. “The first game is always difficult – even if the opponent is not as strong as we are on paper. It is always important to start off with a victory… The next game against Croatia will be harder because they have a better top player and have a higher ranking. We will have an early night and will be in good shape tomorrow morning”, Patrick Franziska. Portugal experienced little difficulty in seeing off Slovenia in its first Group B encounter, as the 2014 European champions stormed to a 3-0 victory. Marcos Freitas and João Monteiro came through their respective fixtures against Darko Jorgic (8-11, 11-4, 11-5, 11-3) and Bojan Tokic (11-9, 11-5, 8-11, 11-4) to give Portugal the advantage before the match was decided in the country’s favour thanks to Tiago Apolónia’s straight games win against Deni Kozul (11-9, 11-7, 11-5). “It is always important at the outset of a tournament to start off with a victory against an opponent like Slovenia, and as I knew the hall from the Olympic Qualifying Tournament, I did not feel particularly nervous as I am accustomed to this kind of pressure. Besides the playing conditions are excellent”, Tiago Apolónia. Croatia was the other team to prevail in the Men’s Championship Division with a good result against Belarus. Tomislav Pucar recovered from a game down to defeat Belarusian competitor Aliaksandr Khanin (8-11, 11-5, 11-9, 11-8) and a brace of victories from Andrej Gacina over Pavel Platonov (11-7, 9-11, 12-10, 11-9) and Aliaksandr Khanin (11-4, 11-3, 11-9) proved enough to give Croatia the win. There were a couple of standout results in the Men’s Challenge Series competition as the Netherlands and Lithuania saw off higher ranked opposition. The Dutch team of Ewout Oostwouder, Laurens Tromer and Rajko Gommers pulled off a 3-0 victory against England in Group A, while over in Group D a superb performance from Alfredas Udra guided Lithuania to a wonderful 3-1 win over Serbia. 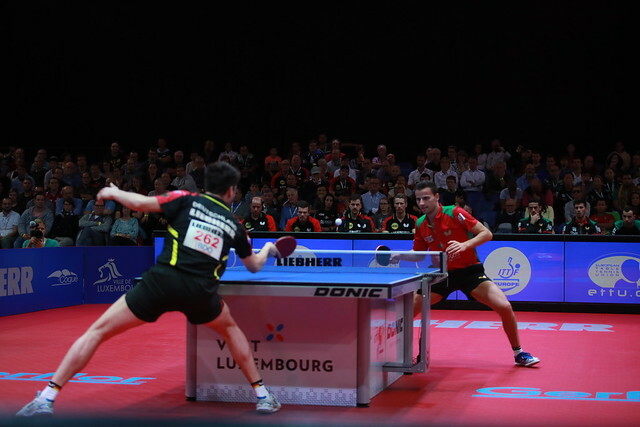 Cyprus took the spotlight in the Men’s Standard Division as Hristo Hristonov, Marios Yiangou and Yiangos Yiangou emerged successful against opponents Latvia in a thrilling 3-2 battle.